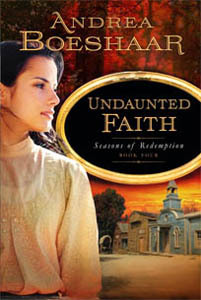 Journeys to Joy: Andrea Boeshaar - UNDAUNTED FAITH - from SEASONS of REDEMPTION - wonderful new release! Andrea Boeshaar - UNDAUNTED FAITH - from SEASONS of REDEMPTION - wonderful new release! Joy's Joy~Ful Journal owes Andrea a huge apology. Yes, I have to begin a perfectly wonderful blog post with an apology - every English teacher will tell you to NEVER, EVER write an apology at the beginning of a letter - Hmmm - good thing this isn't a letter, then? I was so honored and so blessed to have been considered by this tremendous author. To be honest - she's the first historical genre author I'd read and my love for her grew as her books began to multiply on my personal book shelves. Here's the apology> After her most generous request for me to feature her I told her how excited I was and how she would fit right into the Spring~Blog~Fest here on Joy's Joy~Ful Journal in the middle of May - the last month of the Fest. She agreed - sending me the information I requested of her almost immediately. THEN, I went back to her and asked if I could move her week due to the scheduling problem with another author. She, in her sweet way, told me whatever would work for my blog was fine. I am not sure who was being tested, Andrea's graciousness or my willingness to change MY plans for God's. Yes, I had to go back to Andrea this last weekend and ask her to change back to the original week due to a glitch with the other poor author's deadline. Andrea has earned my undying devotion and if it wasn't there before, well, it certainly is now. My hat is off to you, Andrea Boeshaar. You are one very classey lady author. I'm married and have three grown sons, one daughter-in-law, four grandchildren. I also have a fine church family. What outside interests do you have, Andrea? I love to take walks. I recently underwent a total knee replacement and I"m healing up just great. I can't wait to take regular walks out side later this Spring. My husband and I also enjoy seeing our grandchildren. We make that a regular practice. What new lessons do you believe the Lord is teaching you right now? God has shown Himself faithful in so many ways. He takes good care of me. One of the lessons I'm learning is that because my Heavenly Father is the King of Kings and I am His child, then that makes me . . . a princess! So, I ought to act like royalty, not in a snotty manner, but a manner in which I treat myself with respect and take care of myself. The Bible says that we should love others as ourselves, But if we don't love and respect ourselves, we cannot love our neighbors. That said, I have to ask - hasn't God been really moving in your writing life? What do you see on your horizon? What are you working on since doing that? I'm writing a short contemporary Christian Romance novel and I'm hoping to get a proposal for it to my agent Steve Laube soon so he can shop it around. Andrea, what is the one thing you wish you'd known before you started writing novels? I'm afraid I don't read as often as I'd like. With researching my historical novels and all he time spent writing them, I barely have time to clean my house and see the grandkids, let alone read. Still, I try to read a book every couple of months and I love to read my friend's books. Right now I'm reading Louise Gouge's - At The Captain's Command. And then I'll begin Karen Witemeyer's To Win Her Heart. I'm curious as to how you choose your settings for your books, Andrea. Somehow certain areas just grab me, like the Arizona Territory in 1867. You'll read about it in Undaunted Faith, Book 4 in my Seasons of Redemption series. I'm also interested in local history. Book 2 in my series takes place here in Milwaukee. Book 3 is set in Chicago and hen in Milwaukee again. I love to research my hometown and my State. My next series, -Fabric of Time, - will take place in Wisconsin. 2.) Learn all you can about writing and hone your skills! 3.) Trust God to open the doors to your success. Then don't be afraid to walk through them. I really needed to hear/read that, Andrea. Your timing couldn't have been better. The McCabe brothers have their hands full. Trouble on the range and trouble in town. But they never expected their sweet school teacher, Bethany Stafford, to j join their mix of woe. When her reputation is unfairly tarnished, Pastor Luke McCabe is quick to propose marriage. But Bethany wants better than a marriage of necessity to save her good name. Could Luke ever come to love a plain "little field mouse" like her? Dr. Annetta Cavanaugh has her own questions about men and their intentions. While Pastor Jake McCabe seems sincere, she still has her doubts about him. But after he accompanies her on a medical call, she sees a whole new side of him and can't help but admit her attraction to the handsome pastor. However, there's evil brewing in town - a lawlessness that even the sheriff cannot tamp down. Finally, it comes face-to-face with both Luke and Jake and it threatens the lives of the women they love. Are the McCabe brothers ready for the fight of their lives? Once there, readers can find my blog and a lot of other information. They can also find me on Facebook. Hours later, Bethany awoke. Instead of darkness, shafts of sunlight streamed in through the crevices of the barn's roof and walls. Many times on the farm where I grew up I saw this exact scene - the light streaming in through the cracks. Alerted by the gunshot Luke rose from the breakfast table and strode to the door. Even squinting into the bright sunshine, Luke recognized Dirk Crawford in the distance. He rode fast toward the ranch with two other men in tow. She wrapped her skinny arms around his midsection, and together they followed Jake into the barn. I had no problem picturing this character - a child. A host of emotions gripped Luke, but righteous anger won out. What a guy! This is just a small taste of the writing expertise of Andrea Boeshaar. Her words evoke a sense of being in the presence of the characters she writes about. Thank you, Andrea, for being such a gracious guest. For allowing me to move you back and forth across the Tuesdays in the month of May. You've been very generous in your patience with me. 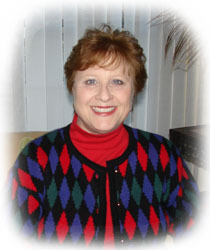 Please be sure to visit Andrea Boeshaar at her website and find her on Facebook. I've been itching to get my hands on one of her books for years! Great post Joy! I really enjoyed it. Oh, and I just love the interview! Now, I'm behind in this series - I need to get books one - three and it was so hard to put off doing that to get book four read so I can promote it here - I'm not giving up on getting them. I'm so glad that she did! Thank you for posting this interview, Joy. It was my pleasure! A very interesting series! Thank you to both of you for the interview and the information! 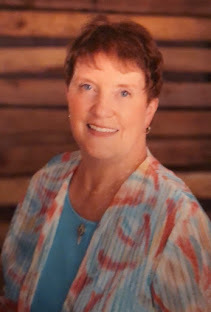 Thanks for stopping by today - Sue - I've enjoyed getting to know you through our Great Lakes Chapter of ACFW - I also look forward to working with you in Crits&Edits. May God bless you and your writing abundantly above all that you may think or ask! Joyfully appreciative of your visit!